Universal City, Calif. (November 28, 2011) - To Kill a Mockingbird, one of the screen's most beloved and critically acclaimed films, celebrates its 50th anniversary with a commemorative Limited Edition Collector's Series Blu-ray(TM) Combo Pack as well as on Blu-ray(TM) Combo Pack and DVD from Universal Studios Home Entertainment on January 31, 2012. The powerful and poignant adaptation of Harper Lee's Pulitzer Prize-winning novel hits the half-century mark, digitally remastered and fully restored from high resolution 35MM original film elements, plus more than three-and-a-half hours of bonus features chronicling the making of the cinematic masterpiece. 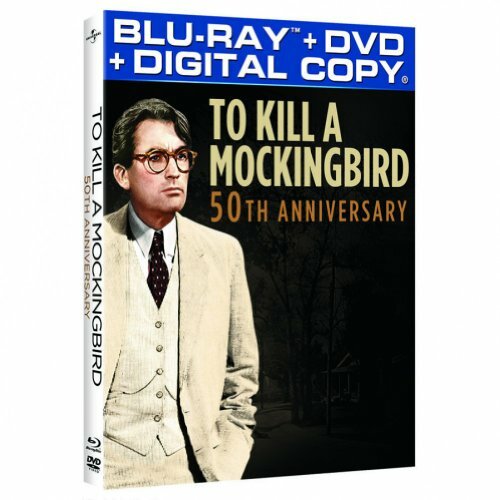 The Limited Edition Collector's Series Combo Pack of To Kill a Mockingbird: 50th Anniversary Edition will include a Blu-ray, DVD and Digital Copy of the film, packaged in a hardcover book featuring exclusive movie memorabilia including script pages with Gregory Peck's handwritten notes, storyboards, poster art and much more. Released theatrically in 1962, To Kill a Mockingbird won instant accolades for its nuanced performances, splendidly crafted narrative and bold endorsement of racial tolerance, fairness and honor, a combination that still resonates with audiences today. It earned eight Academy Award(R) nominations and three wins including a Best Actor statuette for Gregory Peck in one of his most iconic roles asthe principled Alabama lawyer Atticus Finch, Best Adapted Screenplay and Best Art Direction. The prestigious American Film Institute lists To Kill a Mockingbird as one of the 100 Greatest American Films and also names Atticus Finch as the No. 1 Film Hero of All Time. A timeless, enduring classic that remains as relevant and impactful today as it was at its release, To Kill a Mockingbird''s appeal continues to span generations. *	Fearful Symmetry-- A feature-length documentary on the making of To Kill a Mockingbird with cast and crew interviews and a visit to author Harper Lee's home town. *	A Conversation with Gregory Peck-- An intimate feature-length documentary on one of the most beloved actors in film history with interviews, film clips, home movies and more. *	Academy Award(R) Best Actor Acceptance Speech-- Gregory Peck's speech after winning the Academy Award(R) for his performance as Atticus Finch. *	American Film Institute Life Achievement Award-- Gregory Peck's memorable remarks upon receiving the AFI Life Achievement Award. *	Excerpt from "Tribute To Gregory Peck"-- Cecilia Peck's heartwarming farewell to her father given at the Academy in celebration of his life. *	Scout Remembers-- Actress Mary Badham shares her experiences working with Gregory Peck. *	DIGITAL COPY: Owners of the Blu-ray(TM) Combo Pack can also download a digital version of the full-length movie from participating digital retailers to enjoy on a choice of popular electronic and portable devices. *	U-CONTROL: SCENE COMPANION: Available on To Kill a Mockingbird: 50th Anniversary Edition for the first time, viewers can watch interviews, see photos and more during key scenes with this picture-in-picture companion featuring narration by Gregory Peck's Family. *	BD-LIVE(TM): Access the BD-Live(TM) Center through your Internet-connected player to watch the latest trailers and more! *	ADVANCED REMOTE CONTROL: A sleek, elegant new way to operate your Blu-ray(TM) player. Users can navigate through menus, playback and BD-Live(TM) functions with ease. *	VIDEO TIMELINE: Users can easily bring up the video timeline, allowing them to instantly access any point in the film. *	MOBILE-TO-GO: Users can unlock a selection of bonus content with their Blu-ray(TM) discs to save to their device or to stream from anywhere there is a Wi-Fi network, enabling them to enjoy content on the go, anytime, anywhere. *	BROWSE TITLES: Users will have access to a complete list of pocket BLU(TM)-enabled titles available and coming to Blu-ray(TM). They can view free previews and see what additional content is available to unlock on their device. *	KEYBOARD: Entering data is fast and easy with your device's intuitive keyboard. Experience one of the most significant milestones in film history like never before with To Kill a Mockingbird 50th Anniversary Edition. Screen legend Gregory Peck stars as courageous Southern lawyer Atticus Finch - the Academy Award(R)-winning performance hailed by the American Film Institute as the Greatest Movie Hero of All Time. Based on Harper Lee's Pulitzer Prize winning novel about innocence, strength and conviction and nominated for eight Academy Awards(R), this beloved classic is now digitally remastered and fully restored for optimum picture and sound quality and boasts hours of unforgettable bonus features. Watch it and remember why "it's a sin to kill a mockingbird."